Micheal: What do you think about the crypto space at the moment? CZ: Personally, I think we are in a better place than we were this time last year. We are healthier than ever and there are tons of great things to invest in. The valuations are high and those who are building now have really good products, contrary to how it was when the market was high. Everyone at the conference has many ideas and more people are enthusiastic. The number of people going to conferences, the number of people working in this industry is increasing so the industry still going very strong even though the price of dropped a little bit since last year but if you look at two years ago it was like $300 for a Bitcoin so today’s 3000 it’s not too bad at all. Michael: What’s the vision for Binance going into 2019? CZ: We want to build five to ten Fiat on-ramps around different parts of the world hopefully spreading out from different continents. We see that as a limiting factor for the market and we also see there is an overwhelming need for it in the Jersey market. We want money coming in from the fiat market but on the flip side, we also see the need for a decentralized exchange. Michael: What is happening with the decentralized exchange? Will they be competing against each other? CZ: I don’t think it competes at all. There are three categories really so there are people who use Fiat to crypto centralized exchanges and now you can’t really decentralize anyway because the banking relationship you can’t do it. Then there are people who are using crypto to crypto centralizing because there are very high liquidity faster systems etc and then this exchange you got to rely on exchange some people view that as less secure, some people view that is more secure than doing themselves and then there are the guys who want to control their own private Keys who want to be more anonymous. So most of the guys in the core community are heavy power users and they’re loud they speak more and the others, they want to use Dex so we see that as not really competing we’re just offering different solutions to different people and we always let the user choose and we let the market choose. Overall, most people think decentralized exchanges will be the future. M: Will we see familiar tokens on the decentralized exchange? CZ: I think over time we will see more coins traded on the decentralized exchange because there’s less control we already have confirmation of a number of large projects were doing that they have to migrate completely from Ethereum on to finance. So, basically, if you’re only using ERC 20 as a token there’s no real reason for you to stay on Ethereum. There’s a lot of benefits with Binance, lesser cost transactions and it integrates a native Dex decentralized exchange so you don’t have to use a slower more expensive distance-wise exchange. So the Binance chain is actually a very simple chain where to create a token you don’t write a small contract so you just you just specify a few parameters you specify the token name the token symbol and how many decimals you have and pay a relatively large fee initially as we want to block out the scammers. Pay a fee in and boom you have your current you have your token so it’s much easier to use much less programming involved and so because we don’t have the smart contract there will be no EVMs making virtual machines to be faster so it’s a much condensed special-purpose chain. M: What are your opinions on STO’s? CZ: It is definitely a very interesting space but excuse relates very heavily to regulatory regulations so we already have regulatory licenses at different places with different partners long term. It’s not our strength so we’re kind of waiting to see how other people do it and once other people figure out what they do. We can potentially copy them shamelessly and then grow that. It requires a lot of lawyers a lot of guys in the regulator space so it’s one for the future, we are more technology-based right now. M: What’s the weirdest place you have used Twitter? CZ: I don’t know, I love Twitter. I am just myself and it’s nice to interact with the community and get feedback. Sometimes I attack people sometimes I am polite, I just am myself. M: Tell us about your Binance tattoo? CZ: I was in Singapore with Gareth and Luke, and Luke had a bitcoin, coin finance tattoo and he said he was going to get a Binance one so I thought I should get one also. Then Gareth said he wanted a Binance tattoo too. So the three of us went to a tattoo shop in Singapore I got it like about a month ago so now it’s healed really well I like it. M: What’s your next tattoo going to be? CZ: Yeah actually I’m okay with one for now. I think for me the logo is very meaningful, I think if you want to put something on your body it has to be meaningful to you. I like it, yeah but I don’t think I’ll get a second tattoo anytime soon! What about a Boxmining tattoo, @boxmining? 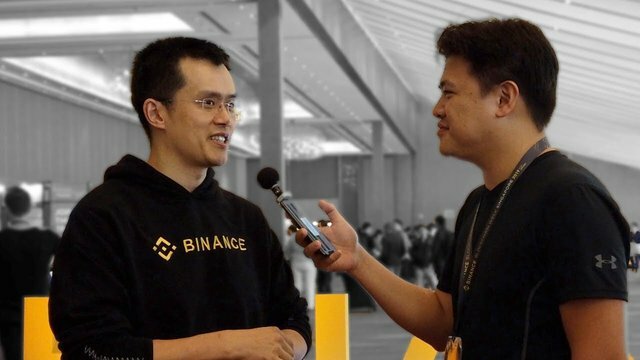 Binance will be not only a crypto exchange but also it will be one of the biggest company in the world. They can beat any big company in near future. Best of luck Binance.